It all began on the 7th of February 1998, when Nobody and Mary started a heavy metal project together with Kirk. A demo tape called "Judgement" was recorded later that year, but for one reason or the other Nobody and Mery decided to leave the band, but Kirk (lead guitars and vocals) carries on writing songs and looking for new band members. After many changes in the line-up, in the spring of 2010 Wolf and Wolfdance join the band on bass and drums, respectively. Cip joins the band on rhythm guitar in the autumn of 2010. In December 2010 a new logo is created for the band by Stan W. Decker and in 2011 the band records their first EP, "The Prophecy". 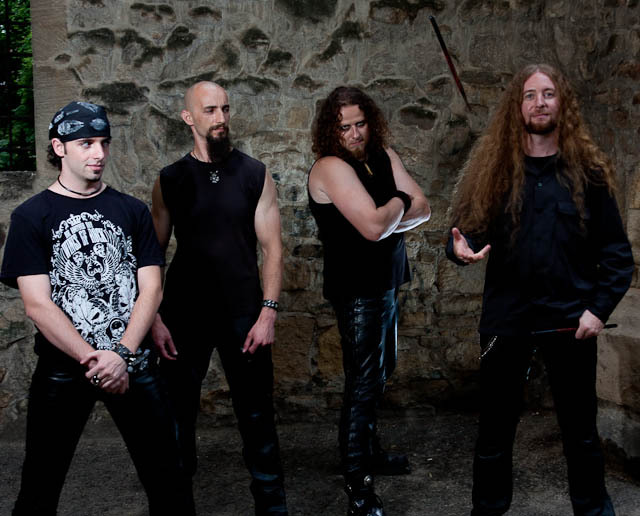 Apocaliptic plays melodic death metal, influenced by Iron Maiden, Children of Bodom, Amon Amarth, Death and Megadeth. We bring something new, our songs are based on 3 guitar players and we ROCK!!! Apocaliptic has released a demo tape "Judgement" in 1998 that was very well appreciated by the public and broadcasted on the radio. In 2011 we have recorded the first EP called "The Prophecy", soon to be released. Apocaliptic only plays live! We had concerts in 1998 and 1999, playing at various music festivals across the country. We play because this is what we feel we must do. Labels/zines/promoters should be interested in the music we play. Apocaliptic will release the first EP later this year. We hope it will be well received by the public and we hope to be promoted in other countries in the world as well.